Calla Lily to brighten our garden’s shady areas! A strikingly beautiful and hardy perennial to add to one’s garden and to brighten shady areas. 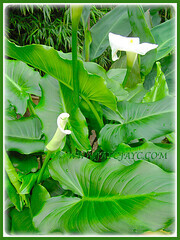 We’ve not grown the Calla Lily before as unsure where to purchase this lovely plant. Nevertheless, we were captivated by the loveliness of its flowers that contrast wonderfully with its dark green foliage. It was love at first site when we first saw these gorgeous flowers in August, 2011 at Genting Highlands, Peninsula Malaysia. It is the national flower of the island nation of Saint Helena, where it grows widely. 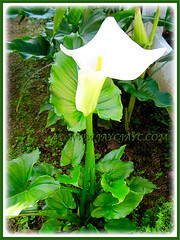 Common Names: Calla Lily, Arum Lily, Trumpet Lily, Common Arum Lily. 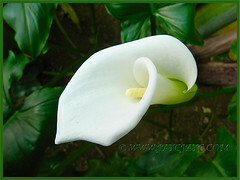 Etymology: The genus Zantedeschia is named after Professor Zantedeschi (1773-1846), an Italian physician and botanist. 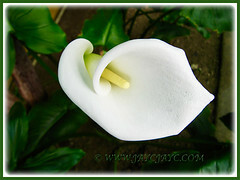 The common epithet, Calla Lily is associated with the lily as a symbol of purity. Origin:Native to southern Africa in Lesotho, South Africa and Swaziland. Naturalised worldwide. Plant type: An ornamental and perennial plant. 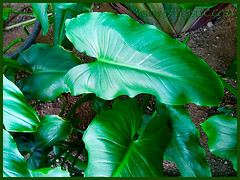 Features: Zantedeschia aethiopica is a one of the most popular species belonging to the genus Zantedeschia that consists of about 8 species and popular too with hybridisers that came up with numerous hybrids and cultivars.It grows to 0.6–1 m tall, with large clumps of broad, arrow shaped and leathery dark green leaves up to 45 cm long.The inflorescences are large and produced on a 60 cm stalk. A pure ivory- white spathe up to 15 cm long and 12 cm wide will envelope a yellow spadix up to 9 cm long. Its lower part creates a wide-mouthed funnel and the much wider upper part has its tip curled under. The spadix that produces a faint, sweet fragrance is covered with tiny bright yellow anthers which is the male parts, while the lower female part is covered with yellow-green to whitish pistils. These will eventually develop green berries which turn to orange when ripen. It is a rhizomatous, herbaceous, evergreen and perennial plant where rainfall and temperatures are adequate, and deciduous where there is a dry season. 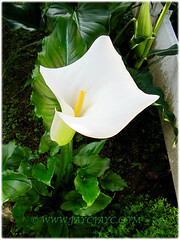 Culture (Care): Zantedeschia aethiopica or Calla Lily grows easily with least maintenance. Light: Best in filtered sunlight or semi-shade. Moisture: Moderate water requirement. Water regularly for optimum growth. Soil: Best to grow in organic-enriched, loamy and well-drained soils. Others: Remove sun-burnt leaves and withered flowers to keep it tidy. Feed it fortnightly with a balanced foliage and flowering fertiliser. Generally free from serious garden pests and diseases. It is classified as a toxic weed and pest in Western Australia. Do be aware that Zantedeschia aethiopica contains calcium oxalate and ingestion of the raw plant may cause a severe burning sensation and swelling of lips, tongue, and throat. Stomach pain and diarrhea may occur. For subtropical and temperate regions: Hardiness: USDA Zone 8 to 10, though may survive Zone 7 with some protection. It can be deciduous or evergreen, depending on the rainfall and soil water rather than temperature. The position in which it is planted will also determine size and flowering. The inflorescences are large and produced on a 60 cm stalk and flowers in spring and summer. To propagate new plant, divide the clumps. Alternatively use the seeds that are dried off for sowing in the spring. They should be sown sparingly to allow space for the fleshy roots to form. It can be grown throughout the year in containers and overwinter indoors before the first frost. Propagation: Can be propagated from seeds or division of clumps. 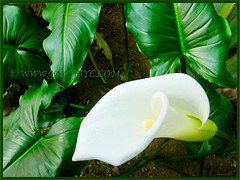 Usage: Zantedeschia aethiopica or Trumpet Lily with its captivating inflorescences is popularly used as a cut flower that lasts a long time in water. Also, it is commercially used too in bridal and funeral flower arrangements as a symbol of purity. Excellent as an ornamental plant and can be grown in the ground, pots or raised planters. The leaves and rhizomes are traditionally used to dress wounds and bites in southern Africa. It has been scientifically observed that this Calla Lily can be used to clean waste water and prevent algae growth in artificial wetland systems. Excoecaria cochinchinensis ‘Firestorm’ cascading spectacularly!